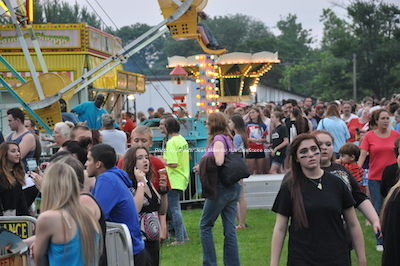 As the sun began to set on Franklin Borough, locals came from Franklin and beyond to enjoy the carnival. Photo by Jennifer Jean Miller. 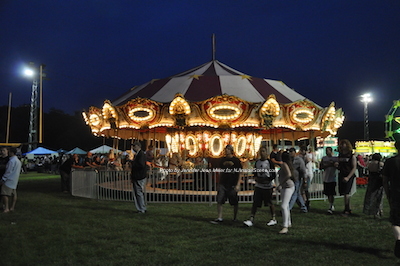 FRANKLIN BOROUGH, NJ – The crowds poured in on Thursday night for the first day of the Franklin Carnival, a tradition that has returned to Franklin Borough in Sussex County after a 20-year hiatus. 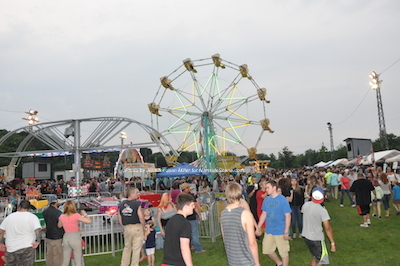 The organizers from the event, volunteers from the Recreation Committee and the borough were amazed at the attendance on the first night, July 2. By 7 p.m. (the carnival started at 6) all of the side streets were packed with cars and the crowds milled around the field adjacent to the Franklin Pond, enjoying all that the event had to offer. 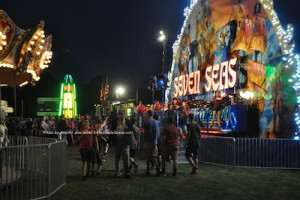 Rides for all age groups filled the field, from small cars that children could drive, to the ferris wheel, to a mirrored carousel dancing with horses, to the scrambler and much more. Attendees wait to enjoy rides and take in the fun offerings. Photo by Jennifer Jean Miller. 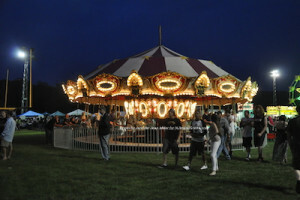 The Franklin Carnival carousel enjoying a spin on Thursday night. Photo by Jennifer Jean Miller. Food was aplenty and the highlight of the evening for many. Along with the traditional carnival fare like cotton candy, popcorn and lemonade, local businesses and organizations were also serving up some enjoyable treats. 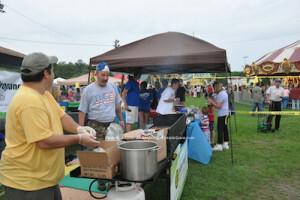 Franklin’s Recreation Committee dished out burgers and dogs, including a specialty hot dog with Taylor Ham. Local eateries like TJ’s served up pizza and soda and other Italian items. There were sausage and pepper sandwiches, cheese steaks, fried Girl Scout Cookies and root beer floats that benefitted local groups like the Boy Scouts and Girl Scouts. Franklin Recreation volunteers dishing out burgers and hot dogs. Photo by Jennifer Jean Miller. 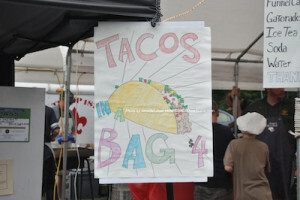 Another favorite was the “Taco in a Bag,” which is a bag of corn chips filled with taco fixings and enjoyed eaten directly from the bag with a fork. “Tacos in a Bag” was a carnival offering. Photo by Jennifer Jean Miller. 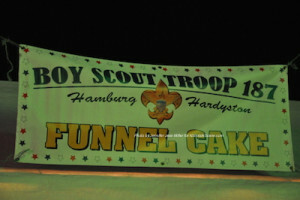 The longest stretching food line was for the funnel cake served up fresh from Hamburg/Hardyston Boy Scout Troop 187. Many waited for an extensive time to enjoy the soy oil fried goodness topped with a generous sprinkling of powdered sugar. 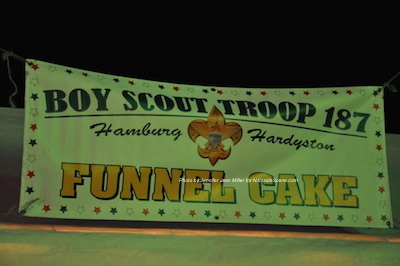 The Boy Scouts served up funnel cakes to an endless line of attendees. Photo by Jennifer Jean Miller. 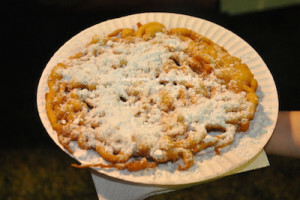 A generous heaping of funnel cake. Photo by Jennifer Jean Miller. Local businesses and organizations had a presence at the event, like PEARLL Yoga for the Soul, Sussex Bank, Laddey, Clark and Ryan and other businesses that were there on site with food and goods for sale. 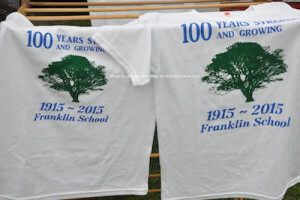 Groups like the Franklin Historical Society and local churches such as Immaculate Conception also had booths at the event. Even USA Ambassador Miss Northeastern New Jersey Miss Randi Storbeck from Vernon was there on behalf of her organization, speaking to people and collecting donations for Saint Baldrick’s. 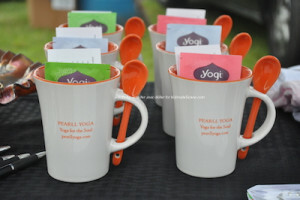 Mugs from PEARLL Yoga for the Soul. Photo by Jennifer Jean Miller. The Franklin Historical Society with t-shirts promoting the 100th anniversary of the Franklin School. Photo by Jennifer Jean Miller. 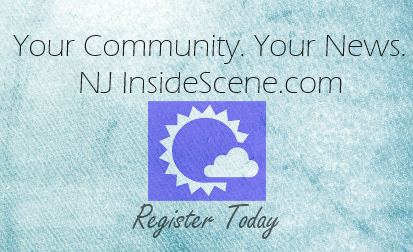 Randi Storbeck of Vernon, USA Ambassador Miss Northeastern New Jersey Miss. Photo by Jennifer Jean Miller. There were tunes spun by the DJ that floated along the air along with the conversation and laughter as the attendees enjoyed the evening. At about 9 p.m. as dusk fell booms resonated over the park and pond with a spectacular fireworks’ display. Braen’s sponsorship of this event was a highlight of the evening, with festivities and fun continuing after the fireworks, which included a couple of grand finales that wowed the crowd. 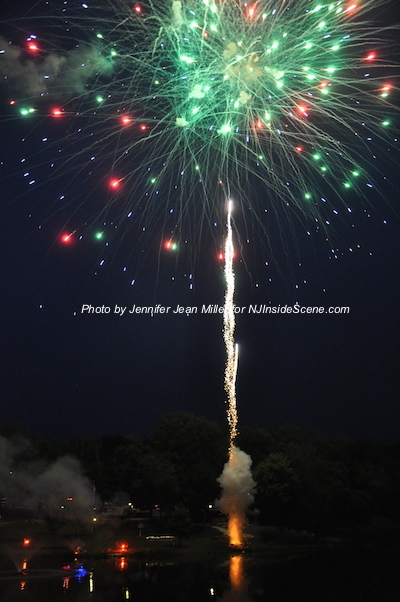 The fireworks on the first night of the Franklin Carnival. Photo by Jennifer Jean Miller. Enjoy the Franklin Carnival, which can also be enjoyed on Friday July 3 and Thursday July 4 from 6 p.m. to 10 p.m. on both days. Entry is free, tickets for the rides start at $1.25 per ticket, or are $25 for a bracelet for unlimited rides. 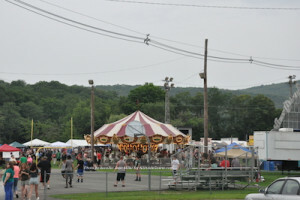 Rides at the Franklin Carnival after night had fallen. Photo by Jennifer Jean Miller. The lights twinkle on the carnival’s carousel. Photo by Jennifer Jean Miller. Proceeds from the carnival benefit the Franklin Borough Recreation Committee Programs, including beautification of the pond area. Click here to read our previous article, which discusses the history of the carnival and other entertainment programs in Franklin’s past.